If you talk to any speculative home builder around town, they'll tell you they would love to find a build-able lot in Northeast Tallahassee. A few of the larger players have subdivisions in which they are building, but for the builders that desire to build only a few each year, developed lots are scarce. It is much harder to truly assess the market for developed lots (compared to doing the same for already-built homes) due to degrees to which each are marketed in the Tallahassee MLS. 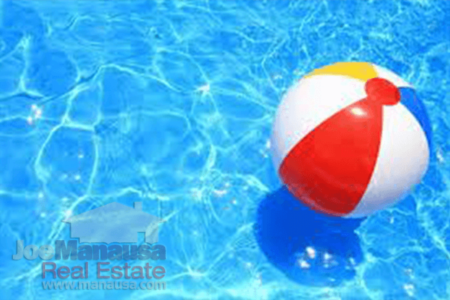 Most homes for sale end up in the Tallahassee MLS because of the success rate Realtors have at getting homes sold. But land is altogether different. And it's often jumbled together, meaning when you see a listing for land, you really cannot tell if it is ready for vertical construction or if a bunch of work is required to be able to build upon it (if at all). 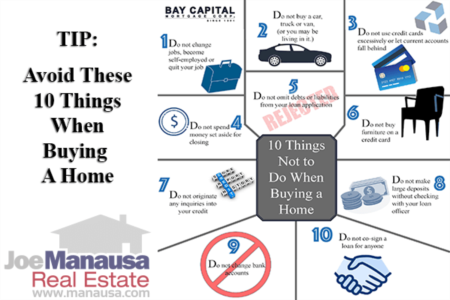 Ultimately, if you are looking to buy a lot on which to build a home, you either work to buy one from a builder/developer who controls the inventory in a subdivision, or you work to buy one from a landowner who might only have one lot to offer. Either way, make sure you have a competent real estate buyer's agent to help you so that you are able to find all the lots possible and negotiate the best price possible. The graph below shows all home sales each year in Leon County, Florida. In the graph above, the total number of home sales each year are shown as stacked columns, with the brown are showing the number of new home sales and the green columns showing the number of existing home sales. The red line shows the share of the market held by new construction, and 2016 ended the year around 9%. Contrast the past five years to the twenty prior, and you will see that new home sales have been seriously crippled recently. 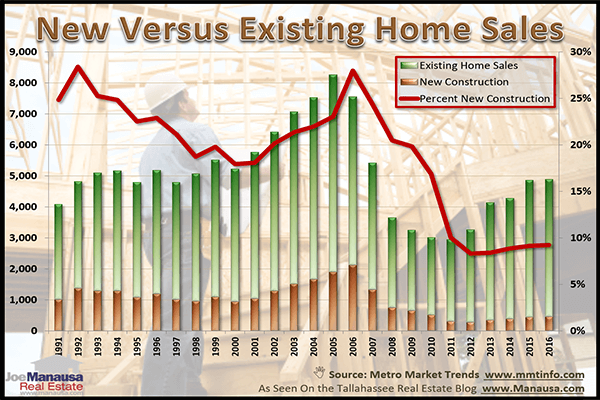 This is in part the result of over-building that occurred from 2002 through 2008 which left Tallahassee with a glut of unneeded homes. Demand is back and the supply of homes for sale (especially in NE Tallahassee) at prices below $400,000 is too low. This means we need more homes, and there is a growing demand. We should expect to see a bit of a resurgence in new construction. And if we're building new homes, we are going to need more lots and land. Expect to see developed lots and land values in Northeast Tallahassee sky-rocket in the coming months and years. If you want to know how to find a great deal on a new home or a lot/undeveloped land, just drop me a note and we'll be in touch right away.